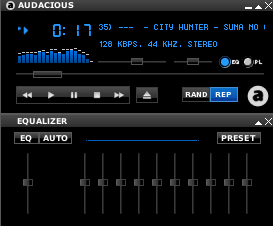 If you want alternative music player that look like winamp, then audacious is similar. Audacious is lightweight music player. This apps available on archlinux repositories. If done run audacious, by default the User interface is like this below. To make look like winamp, open view, then choose interface --> winamp classic interface, and here's the GUI.